(*) We use meteorologic data from our meteorological station in Destnice near Saaz. 30-years average (1961 – 1990) according to Czech Hydrometeorological Institute is being used as long-term average. As for the temperature May was just slightly bellow standard and above-average as for the precipitation (36,6 mm more). (Notice: Due to the power cut in our meteorological station in Destnice on 26th May there were shown only 17,4 mm of precipitation. Alternative measurement however shown 28 mm. Therefore we corrected the total precipitation in May according to this value.) On 26th May strong rainstorms hit Saaz region; in some places even hailstormes appeared. The precipitation amount varied from 28 to 65 mm depending on locality. 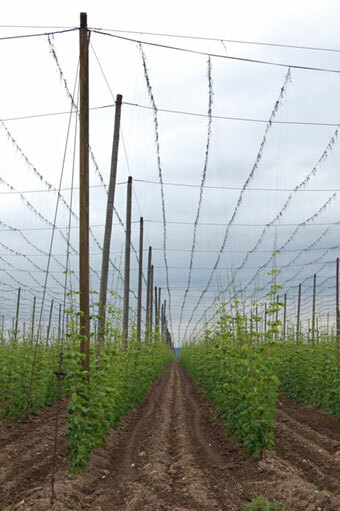 According to the Hop Growers Union press release the hails harmed about 250 hectares of hops, 100 hectares of them were demaged heavily. During the month of May hop training was finished at all the regions and hilling up began. At the end of May hops achieved the average high of 2,5 - 3,5 m. Aphids migration from winter host plants to hops appeared just uniquely. Chemical protection was focused on Downy Mildew. Health state of hop is good. Photo shows the typical hop-garden phase on 28th May, 2009.